For years, Daniel Steep has been captivating audiences throughout North America with his unique blend of comedy, music, high energy magic and illusion. From small gatherings to large fairs, festivals, and corporate parties. We're sure to have a show your guests won't soon forget! A show filled with magic and comedy topped off with your child as the magician's assistant makes for one unbelievable party! Shows and packages vary in length. Contact us today for information on our different birthday packages! Your audience will experience magic like they never have before. Full of comedy, music, and audience participation this high energy show is sure to be a hit with your attendees with non-stop magic and mayhem. Imagine your event attendants going home with a monkey in a banana tree, a butterfly costume, or even Spiderman, made entirely from balloons! Dan the Balloon Man is great for ANY type of event! Many other forms of entertainment including but not limited to: amazing balloon artists, face painters, clowns, costumed characters, story tellers, bouncy castles, DJs, caricature artists, jugglers, and much more! Join Canadian illusionist Daniel Steep as he introduces families to the magical world of farming in Canada. 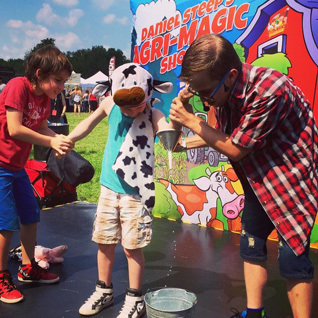 Daniel Steep's Agri-Magic Show is an educational, high energy, and interactive magic show dedicated to greating a positive image of the Canadian Farmer. Through audience participation, comedy, and magic, Daniel shows kids the importance of agriculture in our communities and how they are affected by it. With over 300 annual fair, festival, school, and mall performances including The Canadian National Exhibition! Your audience will be entertained and even learn something without even knowing it! It's kind of like hiding zucchini in chocolate cake! Daniel Steep has worked with a variety of clients of all sizes across North America. Book this young man! You won't be disappointed! An immensely funny, brilliant and engaging show! Fantastic entertainment, definitely having him back! 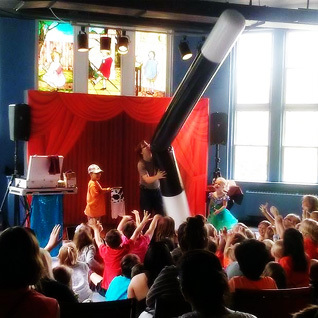 A huge hit with the kids, standing room only every show! Thanks again for an exciting show! © Copyright Daniel Steep 2014 - . Website built by: Jordan Flemming.